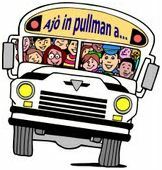 AJO 'IN PULLMAN A ... enjoy yourself around Sardinia to discover traditions, festivals and natural beauties. With which means of transport? Of course the bus! Is an association that loves to carry around Sardinia all those who want to spend different days far from the daily routine! Not only on the occasion of the most interesting and nice feasts and festivals, but also just to go to the beach or in the countryside and stay outdoors. The means of transport? The bus of course! An opportunity to have fun, feel good and meet new friends. Not just a means of transport, but our "means of emotional transport"!